Spring is here! Well at least it’s trying to be here, it’s still pretty chilly where I live. However, that doesn’t temper my excitement that spring is close! I saw fresh corn on the cob at the grocery store this morning and about teared up with joy. This dish here may sound light, it does have the word salad in the title after all, but really it’s super filling. Our family has a pot luck style BBQ for almost every holiday, especially during the warmer months. I’m always looking for new dishes to bring. This one is perfect, just enough familiar ingredients but with a little intrigue to make it feel new. Bring a medium pot of water to a boil, measure out your 1 cup of dry pasta and cook until al dente. I like to toss my pasta in a teaspoon or so of olive oil to keep it from sticking while it cools, then I put mine in the fridge to get nice and cold. Wash, dry and chop your romaine lettuce. 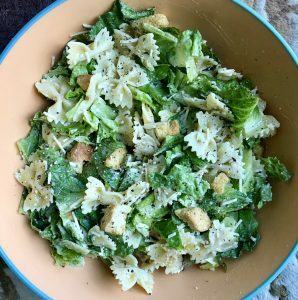 When your pasta is cold, mix it together in a large bowl with your chopped romaine. Next add in 1/4 cup of shredded parmesan cheese and toss with your creamy dressing. Start with a 1/4 cup of dressing and add more from there if you like. Lastly top with small croutons and nice big chunks of fresh ground black pepper. That’s it! Only 6 ingredients and comes together in no time. I’ve got a couple of different tips for this one. 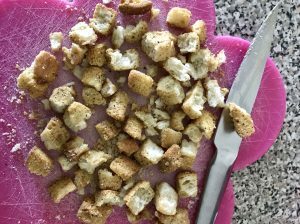 First up, I like to cut my croutons in half, it can be a bit crumbly but I like having everything be a little more streamlined size wise in a salad. Also if I’m lucky enough to get my kids to eat a salad or I dare eat one in front of them the croutons are a hot commodity. This way you’ll double your croutons if any sneaky little fingers want to grab a bite from your salad. Not to mention more croutons equals more texture which is always a win in my book. Next up, don’t skip the fresh black pepper. Almost all pepper grinders have a gauge at which you can decide if you want “mountains” or “dust”. Regular black pepper you find on any table is closer to the dust consistency. We’re looking for mountains in this salad, it’ll give you a nice peppery bite to balance out the heavy creamy dressing. My last tip is to not dress this ahead of time, your lettuce will end up soggy and nobody wants that. 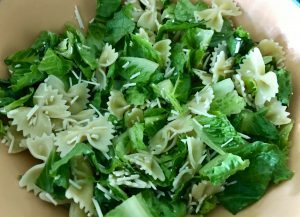 This recipe is perfect for leftover pasta, I sometimes make too much pasta just to have cooked, cooled pasta waiting for me in fridge to make a pasta salad out of. If you’ve already made the pasta ahead of time this salad will come together in minutes. 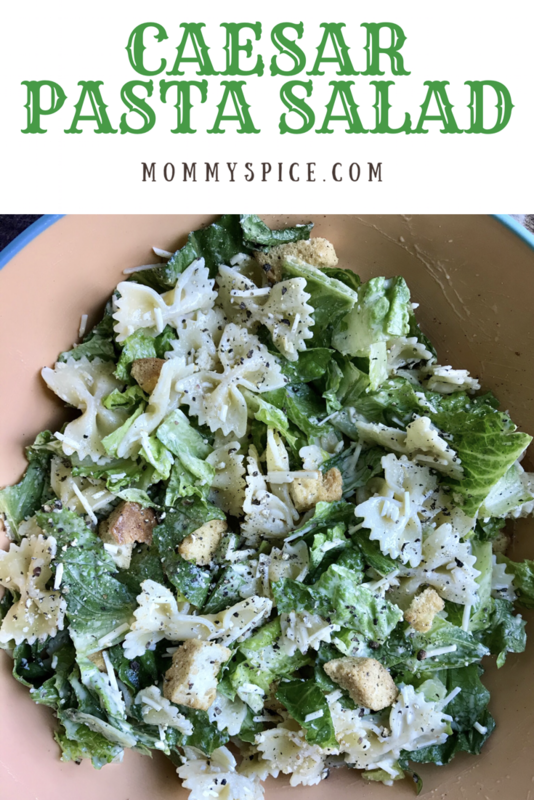 I love this because it’s heartier than a salad but somehow lighter than a pasta salad, it’s right in the middle and makes for the perfect lunch or side to any spring BBQ!